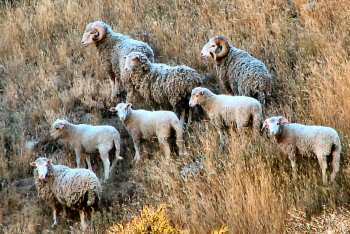 These little-known sheep originate from a feral flock living in Clarence Reserve, Marlborough. They are almost certainly of Merino origin – descended from escaped sheep brought into the area in the early period of European settlement. They have clean faces and bellies and are largely dag free. Such features are typical of sheep which have evolved a resistance to flystrike. The rams have wideset horns. Nearly all of them are white in colour, which is unusual in long-established feral flocks. They tend to be "secretive" in their behaviour and will often keep to themselves when placed amongst commercial breeds of sheep. The fleece is fine but not very heavy. Although a small group of Clarence sheep have been kept in domestication in various places for the last two decades, they appear to have not adapted well to their new environment and breeders have been beset with difficulties. In 2011 the Department of Conservation reported that there are no longer any in the Clarence Reserve, but hunters have found that do still exist in the wild on neighbouring properties, particularly Bluff Station on the top north side of the Clarence River (as in the upper photograph).